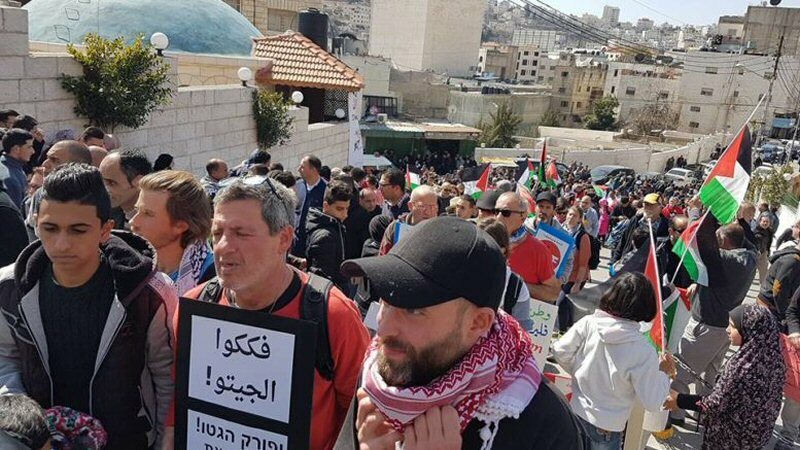 photo: (AIC) Palestinian and Israeli activists march in the West Bank city of Hebron to mark the Ibrahimi Mosque massacre and oppose the occupation, March 2017. Palestinian-Israeli co-resistance is a political, social and cultural necessity imposed by the reality of the protracted occupation. Palestinian-Israeli co-resistance as a concept, position and practice is not a matter of choice. Rather, it is a political, social and cultural necessity imposed by the reality of the long-enduring Palestinian-Israeli conflict. Decades of conflict in the land of Palestine has resulted in overlap and interconnectedness amongst the peoples in economic terms, both concerning the labour force and market, as well as in demographic ones, in shared cities and public spaces, alongside natural resources. These facts make confronting and ending the occupation, achieving freedom for the Palestinian people and securing the conditions necessary to freely determine an end of the conflict both a national Palestinian mission and an essential task for Palestinian society. Israelis who truly believe in ending the occupation and recognising the national rights of the Palestinian people, especially the right of Palestinian refugees to return home, are part of this struggle to attain the political, social and cultural goal of ending the colonial occupation and realising the rights of the Palestinian people. In this sense, Palestinian-Israeli co-resistance means an utter refusal to continue exploiting the Jewish people as tools and fuel for strengthening the occupation and igniting additional aggressive wars in the Middle East. This necessarily includes ending the use of the Jewish people to wage expansionist colonisation wars in the Middle East on behalf of the imperialist states. Israel’s role as the regional policeman of the imperialist powers in the region must end. Pressure Israel to recognise its historical and moral responsibilities for the tragedies suffered by the Palestinian people following establishment of the State of Israel. Recognise the rights of the Palestinian people, including the right of return and self-determination, and the establishment of an independent and fully sovereign Palestinian state with Jerusalem as its capital. Recognize the right of the Palestinian people to resist and struggle to end the occupation and achieve freedom in accordance with international law. Participate in the struggle to end the occupation and achieve a just and comprehensive peace. Personalities, activists, unions, social movements, civil society institutions, academics, intellectuals and politicians are organic partners in this struggle. Rejection of normalisation as a political, cultural and economic mechanism aimed at denying the root, historical causes of the Israeli-Palestinian conflict and dealing with the results of the occupation as inherent Israeli rights to be accepted, thus perpetuating the results of Israel’s wars of aggression against the Palestinian people. Nassar Ibrahim is Director of the Alternative Information Center(AIC).